SPRINGFIELD, Ill. — Kevin Swindell reunites with Venturini Motorsports (VMS) this weekend to substitute for driver John Wes Townley at the famed Springfield Mile driving the No.15 Zaxby’s Toyota. Townley will miss his third consecutive ARCA race after an accident at Pocono Raceway on August 1, 2014. 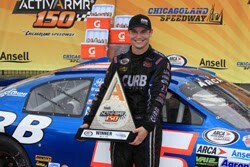 Swindell, who drove eight races for VMS in 2012, earned his first series victory at Chicagoland Speedway. That same year he claimed four top-5 finishes, including a third place effort at Illinois State Fairgrounds (Springfield) and runner-up finishes at Lucas Oil Raceway and Kansas Speedway. Since his stint with VMS, Swindell has gone on to race 18 NASCAR Nationwide races and made his NASCAR Sprint Cup debut in 2013 at Loudon earning a 38th place finish. Practice for the SuperChevyStores.com 100 starts at 9 a.m. with Menards Pole Qualifying presented by Ansell following at 11:15. The 52nd annual SuperChevyStores.com 100 starts at 1:30 p.m. All times are local. ARCAracing.com will feature live timing and scoring of all on-track activity as well as live flag-to-flag audio coverage of the race. Tickets are available by calling Track Enterprises or the Illinois State Fair box office.